We are one of the UK’s leading independent mobile phone retailers with over 10 years’ experience. We thrive on bringing our customers the best deals. Working closely with the networks we have built up strong relationships enabling us to deliver competitive deals against our online competitors. 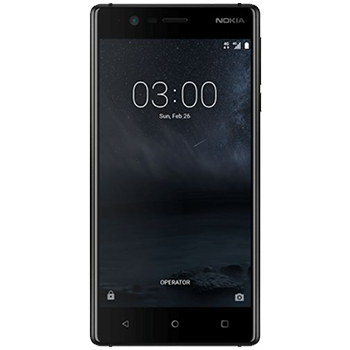 Designed with Nokia's classic design hallmarks: a beautifully crafted and sculpted polycarbonate back, a solid-feeling aluminium frame, carefully finished details, and optimized performance for everyday use. With an 8 megapixel camera with autofocus both on the back and the front, you'll capture the moment beautifully on the Nokia 3. With 16 GB storage for all your photos, plus a MicroSD card slot with support up to 128 GB and Google Photos, you'll be bale to store all of your precious moments on the go. Enjoy fast downloads and uninterrupted music and video streaming with LTE 4G connectivity and plenty of sensors to give you a full experience, including accelerometer, gyroscope and NFC for sharing. Powered by a Quad-core 1.3Ghz processor, and 2 GB RAM you're handset is speedy and efficient.